Sick of a tuberculosis skin make up 2% of the total number of TB patients. Often, patients with tuberculosis of the skin is observed active tuberculosis of other organs. There are focal and disseminated forms of tuberculosis of the skin. Focal tuberculosis of the skin. Anti-tuberculosis skin (synonym: tuberculous lupus, vulgar lupus) is the most common form: Classic manifestation it is soft, translucent pink-red bump - luoma (Fig. 4). When pressed on him Pugovkina the probe forms a retraction or probe falls into a spongy tissue that causes pain and bleeding; when pressed glass reveals the characteristic color of Apple jelly. On the mucous membranes of lypoma bleeds easily. Bumps merge together to form a more or less extensive lesion, sometimes, being exposed to the opposite development in the center, takes a circle, irlandaise shape (Fig. 5). In future it can peel off, buy granulomas or warty form, to ulcerate (Fig. 6) and covered with crusts. In rare cases pitting extends to underlying tissues until the bones, which can lead to the destruction of the nose, eyelids, ears, fingers and other,- disfiguring (motiorola, crippling) vulgar form of lupus. For lupus tuberculosis skin long, healing formed white atrophic scars, again there lupama. The General condition of patients in most cases quite satisfactory. Sometimes vulgar lupus is complicated by the mug, lymphangioma that may lead to the violation of lymph circulation and development of elephantiasis (extremities, lips). Kollikvativny tuberculosis skin (synonym of scrofuloderma) usually occurs in childhood and adolescence; characterized by the formation in the subcutaneous tissue is dense nodes, which gradually increase in size and are soldered to the skin. The latter becomes bluish-red Colour. Nodes are softened and opened with the Department Krasnovidovo content and ulceration with saped edges, the bottom of which is covered with a soft, jelly-like granules. After healing remain uneven ("torn", "shaggy") scars (Fig. 7). 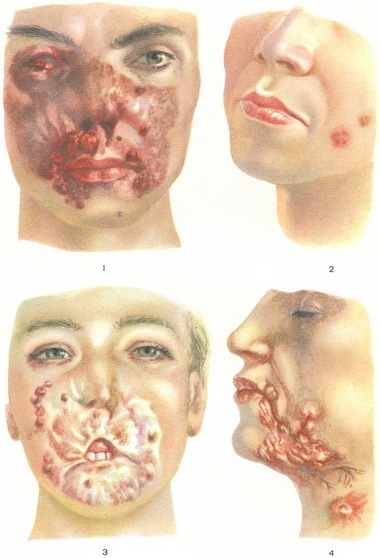 Warty skin tuberculosis is mostly found in men, and often occurs as a result of contamination from the corpses of tuberculosis in animals and humans (cadaveric bump, bump anatomists). As a rule, you receive a single focus (usually on the back of the hand) in the form of clearly delimited rounded infiltrate with warty centre and smooth peripheral area bluish-red colour (Fig. 8). The process ends with the formation tender pigmented scars. Miliardo - ulcer tuberculosis skin and mucous membranes (synonym secondary tuberculosis ulcer). Around the natural holes in TB patients internal organs, there are small nodules that develop into pustules, and at the opening them in sores. As a result of their merger formed painful ulcer with melkopesochnye saped soft edges. At the bottom is visible yellowish smallest abscesses. In the discharge ulcers find Bq. Develops regional lymphadenitis. Tuberculosis skin. Fig. 4-6. Tuberculous lupus. Fig. 4. Lupama. Fig. 5. Extensive lesions (merged lypamy). Fig. 6. Ulcerative form. Fig. 7. Scrofuloderma. Fig. 8. Warty skin tuberculosis. Fig. 9. Disseminated miliary tuberculosis of the skin. Fig. 1. Ulcerative form of tuberculosis erythematosus. Fig. 2. The initial form of tuberculosis erythematosus. Fig. 3. Disfiguring erythematosus tuberculosis (bird's beak). Fig. 4. Scrofuloderma. Fig. 1. Warty skin tuberculosis. Fig. 2. Tuberculous lupus. Fig. 3. Papules-necrotic tuberculosis. Fig. 4. Disseminated miliary tuberculosis of the skin. Fig. 5. Tuberculous lupus red border of the lips and gums. Fig. 6. Lupus-carcinoma. Indurativnyy tuberculosis skin [synonym: snow (indurativnyy) erythema, erythema of Bazin]. As a rule, suffer young women. In the thickness of the subcutaneous fat legs, usually on their posterolateral surfaces appear slightly painful nodes size 3-4 cm in diameter, skin over them becomes bluish-red colour. In some cases, the sites izyaslau. Disseminated miliary tuberculosis skin (synonym disseminated miliary lupus persons). Unlike vulgar erythematosus, knolls not merge (Fig. 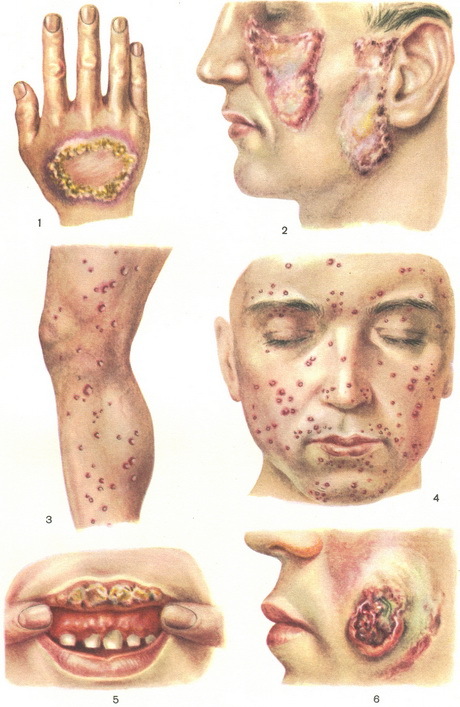 9), in the centre of some of them develop necrosis, the process ends with the formation of pigmented atrophic scars and spots. Lichenoides tuberculosis skin (synonym zoster zolotushnyh); affects children and adolescents. Usually on the skin of the trunk appear grouped bumps the size of 0.2-0.3 cm in diameter, covered with scales of gray. When the dense fit them together formed round, circle, figure plaques. Subjective feelings are absent. Having existed for several weeks or months, rash disappears, leaving pigmentation, sometimes pitting scars, but in autumn and spring time possible relapses. Treatment of tuberculosis of the skin is best done in specialized establishments of sanatorium type - lophosoria. Of anti-TB drugs are most effective is ftivazid. With the defeat mucous membranes should simultaneously with ftivazide assign streptomycin, when scrofuloderma - PAS, with lupus mucous membranes - vitamin D2 (for 3-6 months), in resistant cases popularisations of skin tuberculosis, disseminated miliary lupus face - corticosteroids. Further, preventive, treatment (2-3 courses at intervals of 4 to 9 months.) spend only ftivazide. Patients need good physical living conditions, nutrition, General health-improving treatment (vitamins, fish oil, iron). The prognosis is favorable. When disfiguring scars shows plastic surgery (not earlier than in 2 years after clinical recovery).